Well, it's Tuesday again, and for once, I made a point of using my scraps - although it was just last night. I was tired and did not want to have to measure or sew precisely. I thought it was a good evening to play with my blue and aqua scraps. I started sewing them together in this around and around fashion. This is a technique that I have learned from several places, including from my friend Victoria - Bumble Beans - in her class and from her book, 15 Minutes of Play. I had previously made the pink/red strip and so I just made blue bits in the hopes that I can make a strip about the same size in blue. 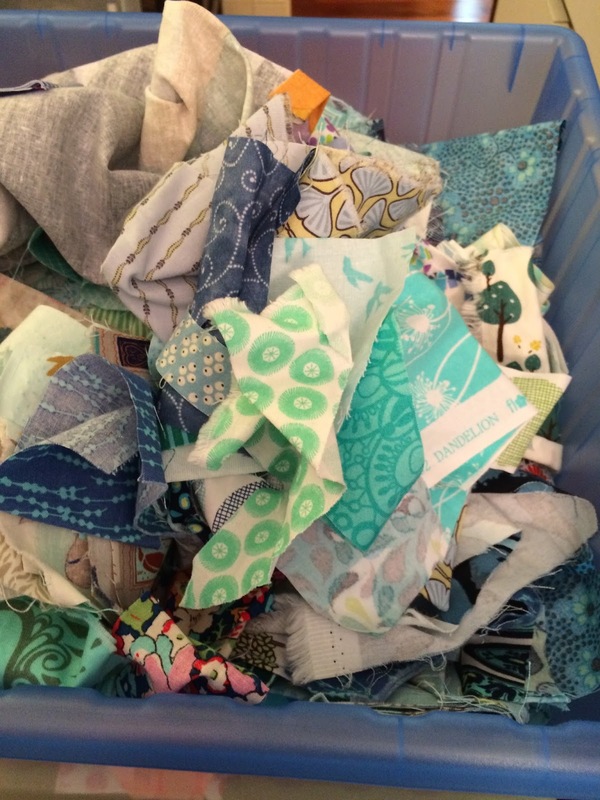 I have a lot of blue scraps, this is not yet making a dent in them. This was such a relaxing sewing session. Sew some bits together, press, and repeat. I had fun chatting on Instagram with some friends about precious fabric and how even with scraps I hesitate to use it. I am hoping to follow Felicity's (Felicity Quilts) motto of "Just Use It Already" this year. 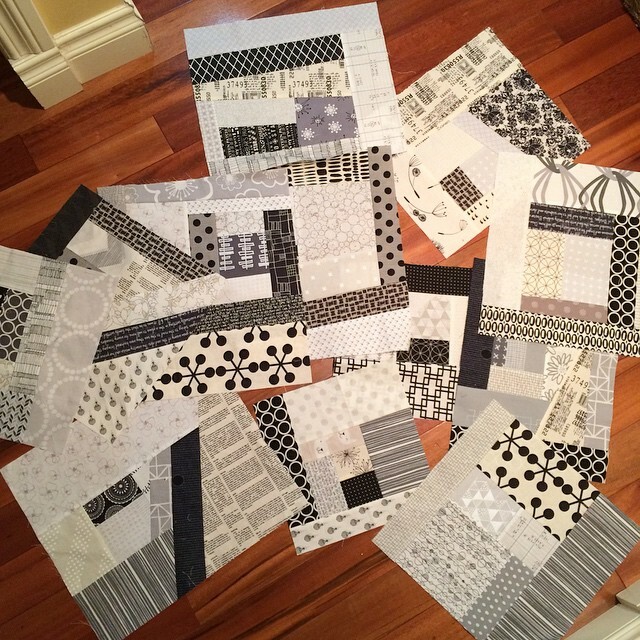 I have a rough plan of using the colourful and swirling scrappy strips with these more sedate blockish black/white/grey scrappy blocks. Maybe the colours will be borders or maybe they will cut through the blocks. I have my usual well thought out plan - we shall see what develops. I need to get back to my scrappy Liberty sampler - Nicky (Mrs. Sew and Sow) has finished the blocks already - go here to see. Nicky has been posting instructions for these blocks and she tells me that I am ok as not all the instructions are up yet, but if you want to make a sampler too the instructions are all here. 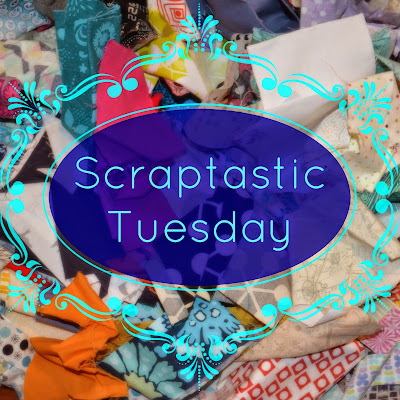 I hope you are enjoying using your scraps, and please plan to join us for the next Scraptastic Tuesday link on the second Tuesday in April, which is April 14, 2015. I like your "fabric growing"; I've just started doing it too, and your pieces are very encouraging. 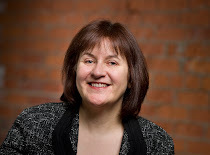 Enjoy the journey and let it happen Leanne! Seems to be working so far - I love the work you have done here! 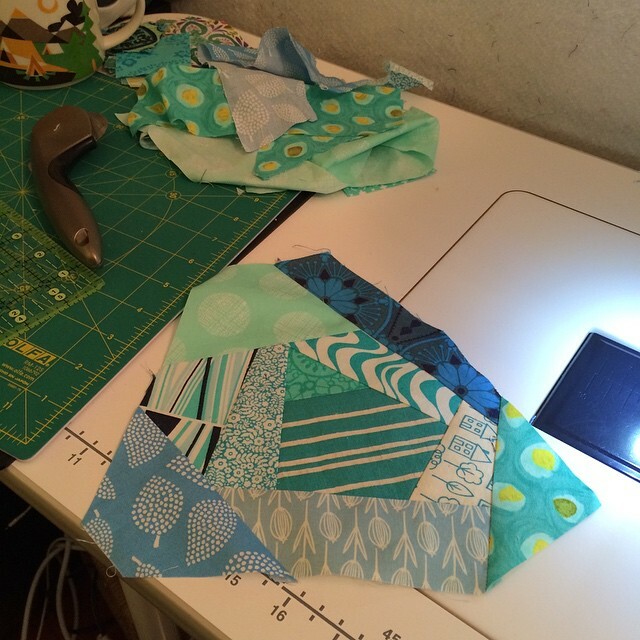 Hi Leanne: I love the neutral blocks and the turquoise scraps look great. I know what you mean about hoarding favourite fabrics even if they are scraps. I think the b/w and colors will look great together! Sometimes sewing is most enjoyable when there is no measuring and stress. I loved your transparency blocks too. I really like you black and white blocks. Great job. Hmmmmm....I'll be interested in seeing the final product. These remind me of fabric amebas. It will be fun to see how you bring the blocks and angular pieces together. I just ordered Victoria's 15 Minutes book. Loved hearing her lecture at QuiltCon but have never taken a class with her. 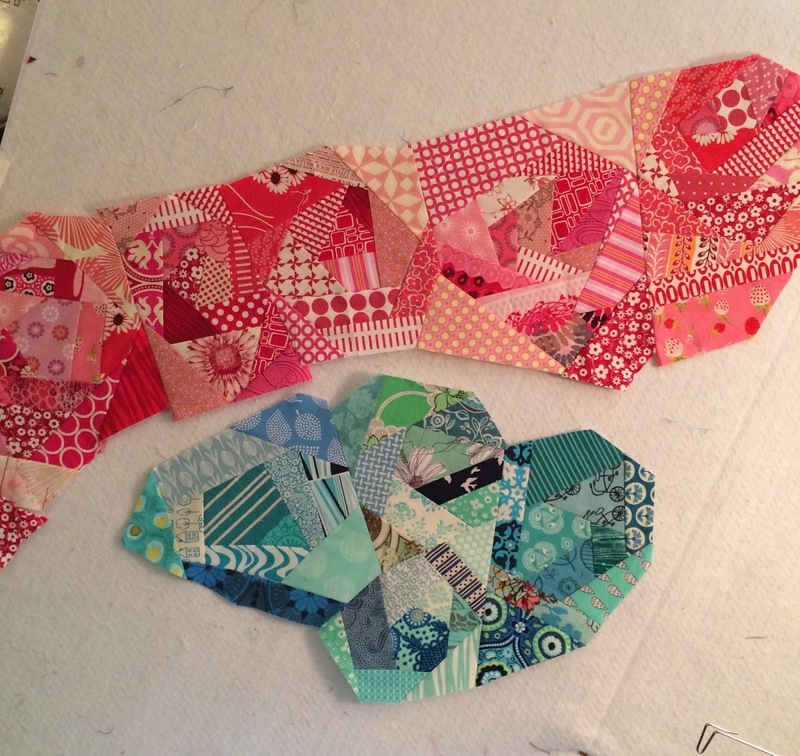 I'm enjoying watching your scrap blocks/strips grow! Thanks for sharing the lovely pictures of your playtime. I was buzzing through my email box and stopped when I saw this... 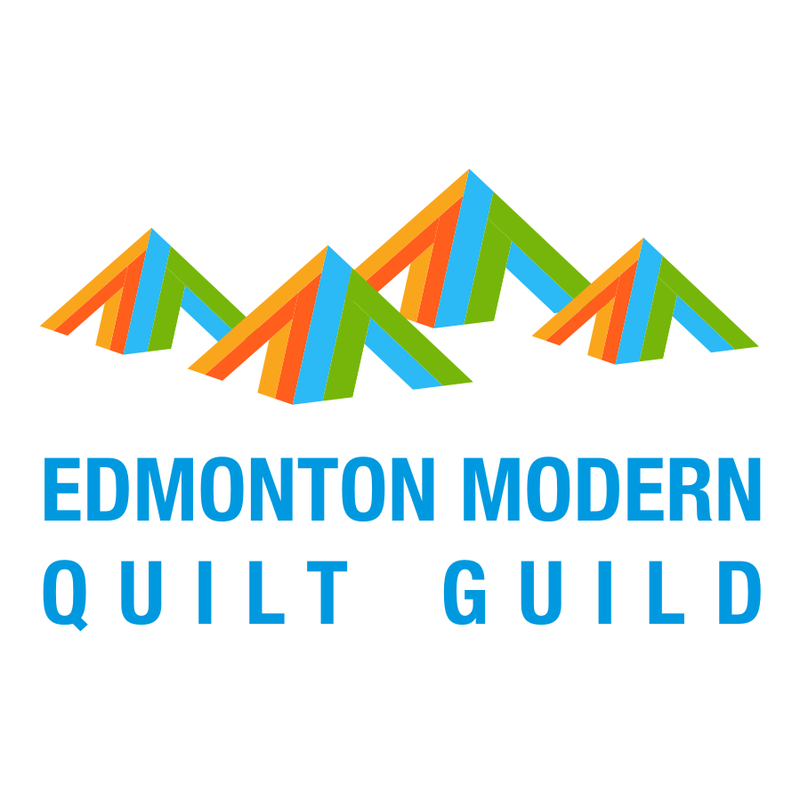 I'm still pretty new to quilting and while I was afraid to try it for a long time, if there's one thing I've learned since starting my first quilt, it's that sometimes, we just need to dive in and see what happens. 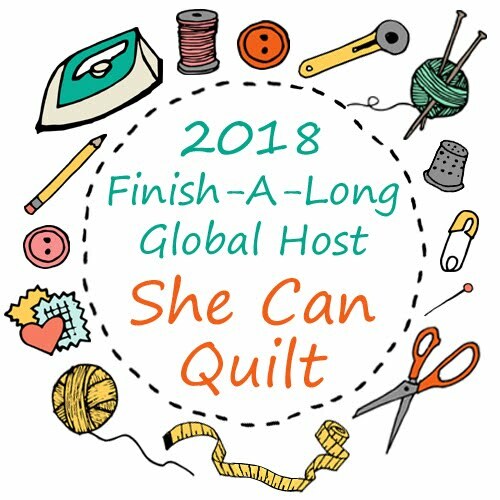 I'm so glad I did this as I've now finished 2 quilts and am about to start (and hopefully finish next week) my third quilt. I just love to create something useful and beautiful with my own two hands. :) My hope is to start using my scraps to do something just like what you've done. 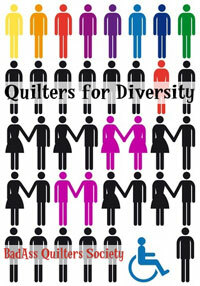 I hope it will lead to my first rainbow quilt. 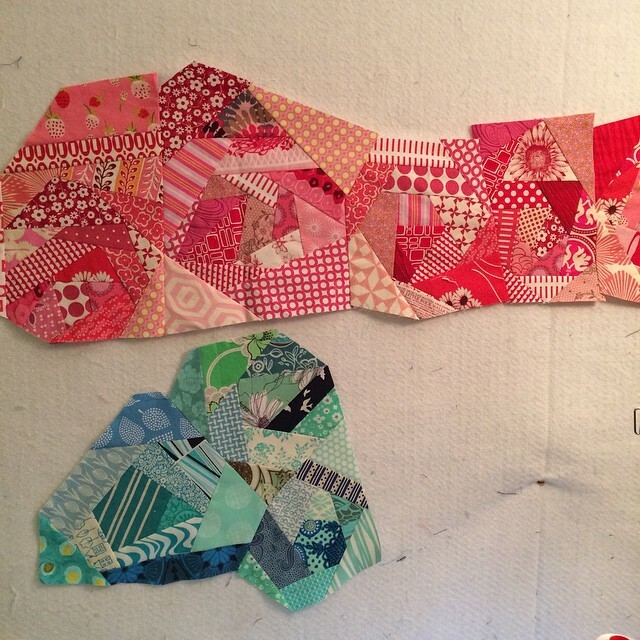 I can see how it would be easy to free flow into that type of a quilt without being so scared of the color gradient. I can't wait to see more! These are so cool! Looking forward to seeing how they continue to grow! Charm Box Blog Hop - Charming, Ta Da! Scraptastic Tuesday - March link winners!